Dove Crag at 792 metres (2598 feet) is situated in the Eastern Fells of the Lake District National Park and is often climbed as part of the Fairfield Horseshoe walk from Ambleside. But the ascent from Brothers Water or Hartsop in the Patterdale valley portrays the best views of the fell, displaying the impressive crags just to the north-east of the summit. This route passes through the beautiful and relatively unknown valley of Dovedale. The valley, with its little beck that flows down it and the crags above, is a very tranquil and picturesque place waiting to be discovered. 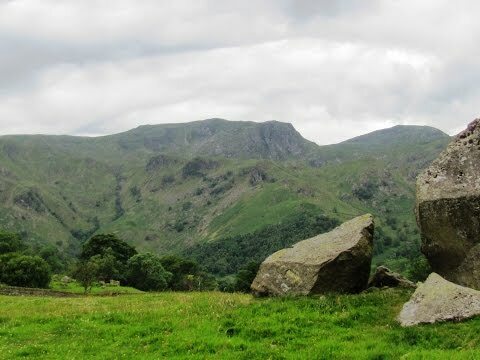 The crags of Dove Crag are 75 metres high at their highest point and are popular with rock climbers. Concealed within the crags is the Priest’s Hole which is a cave of about 5 metres deep with extra protection provided by a wall built in front, this is often used as a rough overnight camp. It is well used and stocked and even has a visitor’s book but it is not easy to find in bad conditions. The summit is a small rock platform with a cairn. A dry stone wall crosses the summit about 15 metres to the west and this runs north to south to the adjoining fells of High Pike to the south and Hart Crag to the north. The best view from the summit is from the edge of the crags and looking down into Dovedale. The Fairfield Group of fells include Fairfield, Hart Crag, Dove Crag, Little Hart Crag and Red Screes. Brothers Water was once called Broad Water and was renamed after two brothers drowned there in the 19th century. It lies at the northern end of the Kirkstone Pass and may be described as one of the Lake District’s smallest lakes or one of its largest tarns and its shallow water is covered by lily pads creating a green carpet on its blue waters which bloom in July. The lake is home to trout and harbours a rare species of fish called schelly. A short walk from Brothers Water car park through woodland skirts the western shore to Hartsop Hall a 16th century building and the Hartsop Hall Lead Mine. Just to the north-east of Brothers Water is Hartsop a small olde worlde end of the road village at the foot of Kirkstone Pass consisting of 17th century grey stone cottages and farm buildings and lies in the Patterdale valley within what was once a royal forest set aside for deer hunting hence Hartsop meaning ‘valley of the deer’. Red squirrels, badgers, birds and other wildlife are attracted to this peaceful valley. The village was a lead mining community and it still retains its historic image in that it has houses with spinning rooms. The villagers would have made their own clothing and sold any surplus in the local market towns. Nearby is the Brotherswater Inn and Sykeside camping and caravan site. Kirkstone Pass is a mountain pass at an altitude of 454 metres, almost 1500 feet. It is the Lake District’s highest pass that is open to motor traffic and connects Ambleside in the Rothay Valley to Patterdale in the Ullswater Valley. In places the gradient is 1 in 4 and provides stunning views of Brothers Water on the descent to Patterdale. Near the top of the pass is the Kirkstone Pass Inn which is the third highest public house in England. It was once an important coaching inn but now mainly caters for the tourists. The pass from Ambleside up to the inn is known locally as ‘The Struggle’. The pass was named after a nearby stone, the Kirkstone, which can be seen standing a few yards from the roadside and several yards from the inn. The stone is so named, as its silhouette resembles a church steeple, Kirk meaning church in Old Norse. Copper and slate mining have taken place in the area for many years and Pets Quarry still currently being worked by Kirkstone Green Slate Company lies just before the highest point of the pass on the Ambleside side. Caudale Slate Mine a few miles down on the Ullswater side was last worked at the beginning of the 20th century. We walk to the end of the car park and go through the gate and follow the path by the shore of Brothers Water. We go through two gates then walk to the right of the buildings following the track round to the right. The track splits and we take the right track uphill along Dovedale with Dovedale Beck down below. We keep following the wall on our left. We go through a gate passing an old quarry on the right and then keep heading forwards uphill into the trees. We walk through the trees still following the wall on our left. We come out into the open and keep following the path going through a gate until we come to a footbridge. We do not cross the bridge but bear right following the path on the right of the stream. The path bears left and then starts to turn right away from the stream uphill. We cross over a little water waterfall and keep following the path. We start to go steeply uphill through the gully. We pass an old building on our right and then the path bears left still steeply uphill. At the top we bear left on the level for a short way then we start going uphill following the cairns to a wall. We now turn left and follow the wall on our right passing the summit of Dove Crag just to the left until we come to two cairns and an old metal fence post we turn left and follow the metal posts downhill. The path then bears right and we keep following the metal posts and then a wall downhill to a crossroads of paths (Scandale Pass) at a cairn and a ladder stile over the wall on the right. We turn left and keep following the path downhill through the valley towards Caiston Glen. After about a half mile we follow the wall on our right until we come to a building. We walk to the right of the building going through a gate. We cross over the field and a stream then cross over another field to the track we set off on and retrace our steps back to the car park at Brothers Water. This is a moderate to hard walk starting on a level track but the paths and tracks become stony and or grassy. Some of the ascent and descent are very steep. Approx 7.4 miles allow at least 4 hours using OS Explorer Map OL5, The English Lakes, North-Eastern area. Start point: Brothers Water free car park. Brothers Water is in the Patterdale Valley in the Lake District. From the A66 at Troutbeck take the A5091 sign posted Ullswater. Follow the A5091 until it joins the A592, on the edge of Ullswater, turn right and follow the road through Glenridding and Patterdale. Brothers Water is about 2 miles further on, on the right. Parking: Free car park at Brothers Water. There are no public toilets, shops or pubs at Brothers Water or in nearby Hartsop. There is the Brotherswater Inn down the road just past Brothers Water and the Kirkstone Pass Inn near the top of Kirkstone Pass. The next nearest facilities are at Patterdale and Glenridding to the north and Ambleside to the south.